There has been plenty of discussion going on recently in various Facebook groups I am on about the whole concept of the use of physical pressure with horses. Pressure – what is it!? The term pressure isn’t really a very helpful one when we are trying to establish what is driving the horses motivations to perform a specific behaviour when physical pressure is a part of the environmental antecedent that is causing the behaviour to occur. Why? Because pressure can be perceived very differently by different learners moment to moment, day to day and between individuals. 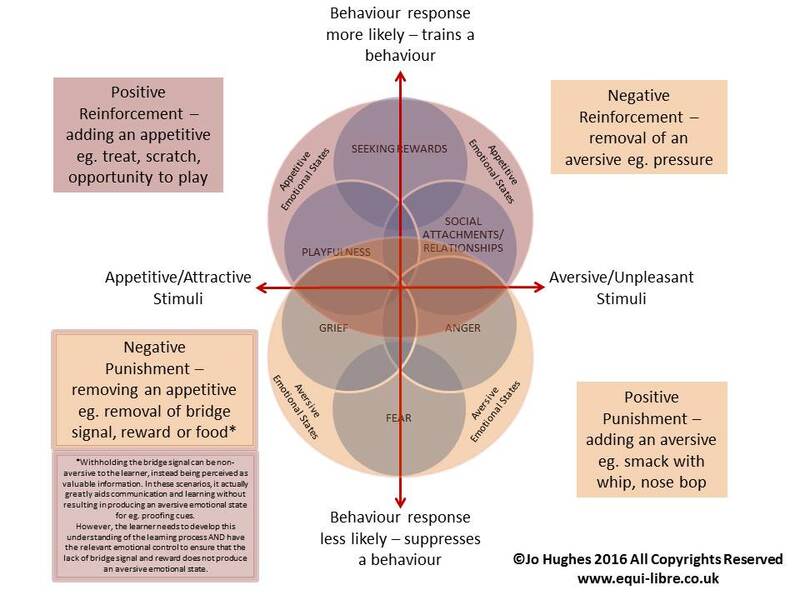 The majority of horse training relies on negative reinforcement – the application and then removal or reduction of an aversive stimulus increases the frequency of the behaviour. The application of the aversive stimulus is what forms the behaviour, upon which the horse seeks to find relief from that aversive, thereby removing or reducing the aversive experience. Through subsequent repetitions, the horse then learns to avoid the onset of that aversive stimulus by responding to a predictor signal that reliably comes before the painful, uncomfortable or frightening aversive itself. However, there seems to be a deepseated belief within the horse world that negative reinforcement is an absolutely necessary part of horse handling, riding and training, which is even more worryingly actually believed to be the case in certain scientific, research based institutions. Is negative reinforcement necessary for handling/riding? It’s a very difficult topic to have a discussion on because everyone’s individual ethical standpoints play a huge part in their beliefs. But if we remove those beliefs from the discussion as to whether the use of aversives is ethical or not, but instead focus on whether they are necessary for handling/riding or performance – the answer we are left with is no, they really aren’t necessary at all. It is possible to train a tactile cue such as touch pressure on a rein or from a leg, where that touch started out neutral to the animal ie. the animal didn’t move away from it at the beginning. By then forming the behaviour using shaping or capturing or any other means of forming a behaviour positively, we can train what looks to an observer as a ‘traditional’ aid – but because of the way it was trained, it isn’t aversive. It’s actually appetitive – something the horse will work to gain and move towards instead of away from. There has to be a motivation for the horse to perform a behaviour – no motivation = no behaviour. If something is neutral to the animal, it won’t respond at all. It’s only through being motivated to find relief from something that they will move away from it and by definition the thing they want to find relief from HAS to be perceived as aversive (a painful, fear-producing stimulus) – otherwise they won’t respond at all since it will be neutral. In order for something to be deemed aversive, and thus for them to be motivated to find relief from it so it can be released, thus allowing the behaviour to be reinforced, it has to stimulate the fear based flight responses to some degree or another. …but this just isn’t a valid statement based on the laws of behaviour and the understanding we now have of the emotions at the most basic primal level of brain processing – affective neuroscience. If you’d like to learn more about how to form behaviours without using aversives, even if that does include tactile touch pressure cues – join us inside The Academy of Positive Horsemanship – an online home study resource focused on positive reinforcement in training.